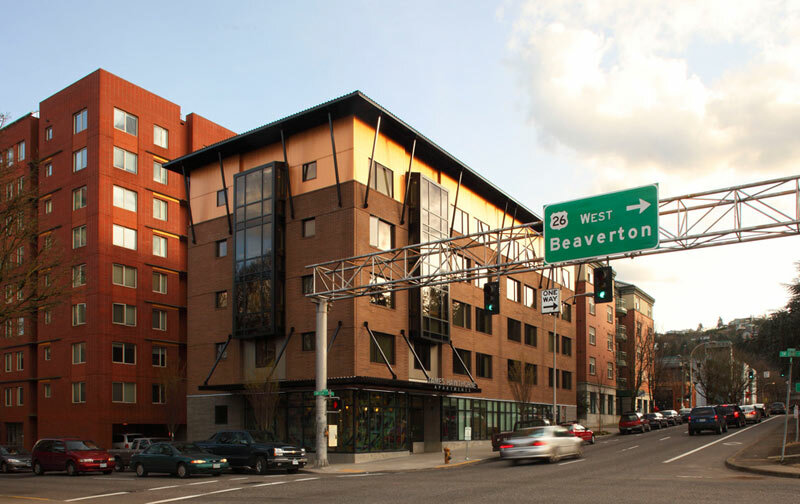 This building in downtown Portland was developed by Home Forward as a new home for Multnomah County’s Bridgeview program, providing short-term housing stabilization for people experiencing homelessness. The Bridgeview program uses a “housing first” model and serves as a key element in the Portland region’s ten year plan to end homelessness. With 24-hour on-site staffing, residents receive case management, mental health treatment, drug and alcohol treatment, clinical supervision, housing services and support services. The James Hawthorne Apartments opened for business in Spring 2010. Home Forward master leased the building to our project partner, Multnomah County. Luke-Dorf, Inc. operates Multnomah County’s Bridgeview program and began operations in the new facility in March 2010, providing short-term housing stabilization for people who are homeless or at imminent risk of homelessness. Community Engagement: Home Forward completed a Good Neighbor Agreement with nearby stakeholders to help ensure quality communication and problem-solving. Sustainability: the new facility received an Earth Advantage Silver rating. Public Art via Per Cent for Art Program: In partnership with the Regional Arts and Culture Council, Jack Archibald created a large leaded glass mural at the northwest corner of the building that wraps around the community room.